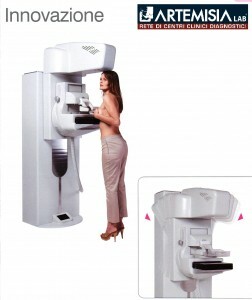 Banking, shopping, mammograms: there are many differences here in bella Italia. Banking was invented in Italy. In fact, the oldest bank in the world is Monte dei Paschi di Siena, which is in deep doo doo over some questionable transactions…but I digress. We needed to open an Italian bank account so we could pay some local doctors’ bills. The process of opening the account was akin to closing on a house, only more difficult. It took several days and 3 visits to the bank, but no money was deposited until the account was open and we had a fistful of documents in hand to prove it. Only then were we allowed to deposit money. And about depositing money: We get reimbursement checks from various sources that we deposit here rather than send back to the U.S. for deposit. One day I popped into the bank with four checks, totaling about $150. No deposit slip is necessary; you just tell the teller your account number. For a deposit of four checks, 10 pieces of A4 paper are generated. Each check requires two (one for me, one for the bank), and the deposit itself requires two (same drill). I signed five times to deposit four checks. They are very nice people, very accommodating, and the experience is very personal, as opposed to the no-human-touch-required ATM deposit. As long as our balance is correct…but many trees sacrificed their lives. On the other hand, no trees are harmed in creation of bank statements: everything is electronic and self-service. When we opened our account, we received a random-code-generator token for secure access. 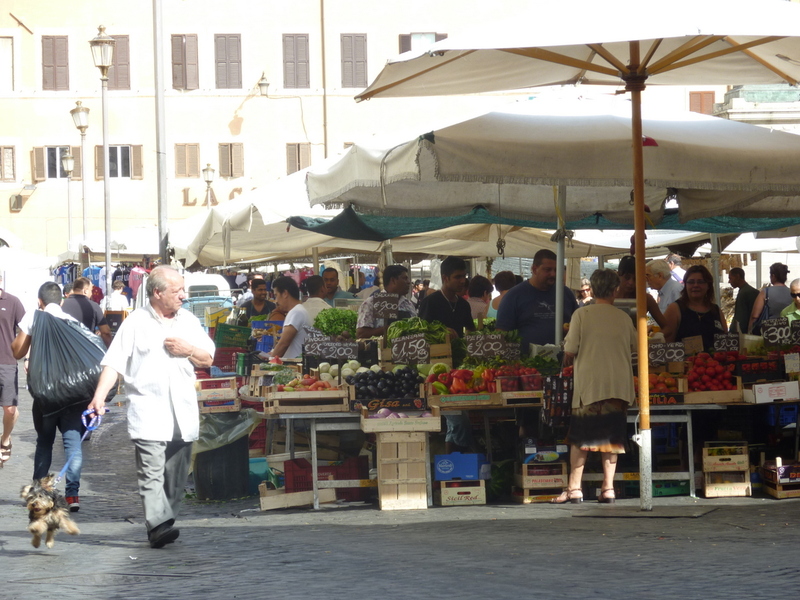 It’s quite efficient and more advanced than the 3 online banking systems we access in the U.S.
Campo dei Fiori market. Let the vendor select your produce or risk a scolding. Shopping has oh-so-many differences from the U.S. First, it can be rather disjointed. Megastores are few, and out in the suburbs. One may need to go to many stores to accomplish what a stop at Target would do. I like small businesses and wandering around Rome, so it’s an opportunity to poke my head into various establishments. But sometimes it is hard to know where to go to get what. Light bulbs, for example, are most likely in an electrical shop, although there are some in the larger grocery stores. Need a curling iron? Don’t try a beauty supply store; go to an appliance and electronics shop. Cosmetics? A profumeria of course. If all else fails, try a ferramenta, which is a household goods store with everything from toilet paper to wine glasses, but in the tiniest stores! Store hours also need to be considered. The larger grocery stores are usually open continually, but a ferramenta or an electrical shop might close from 13:30-16:00. A large wine shop near us does this, even on a busy Saturday, as does Ric’s favorite men’s clothier. They re-open from 16:00-20:00. Since one does not eat before 21:00, these are prime shopping hours. Even the electronics giant Euronics takes la pausa on Saturday and they close on Sunday, limiting recreational shopping. Quality of life versus consumerism: interesting concept. Pat the Bunny? 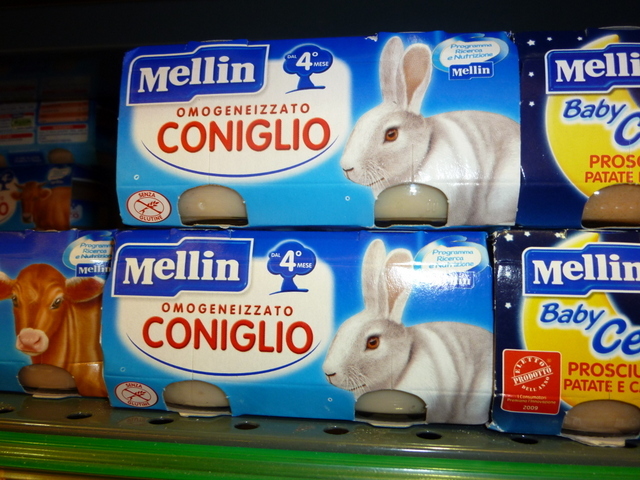 No eat the bunny, Babyfood in flavors attuned to Italian tastes. I have not seen equine…. Milk is sold in shelf-stable cartons that do not have to be refrigerated until after opening, and eggs are always on the shelf at room temp. There is a staggering variety of pasta of course, and the best tuna ever, packed in olive oil. Who needs mayonnaise? Ethnic foods (Mexican, Thai, Chinese) are impossible to find in a regular store. There are specialty shops, but I have not sought them out yet. However, if your infant likes parmesan cheese, salmon, or rabbit, there’s a baby food for that. This picture says almost all you need to know about getting a mammogram here: there is no virtually useless “gown.” Just strip to the waist and belly up to the bar. I was warned by the Embassy Health Unit what to expect, and provided a paper gown to take along, but geez, really, did I want to be la Americana there with the Italian women, the only one shielding her girls with a flimsy gown that was mostly coming off anyway? So I went along with local custom. But there’s one more surprise for those of us from a sheltered, HIPAA-indoctrinated, North American, law-suit inspired environment: many of the mammographers are men. As I entered the office of the senologist (breasts are their only business), I saw a man in scrubs with long gray hair, a little wild, who resembled an aging 60s rock musician. “Please God, don’t let that be my mammographer,” I pleaded silently. I waited with the other women and was relieved to be summoned to an exam room by a lovely young woman; Take off everything from the waist up and so we begin. But could this be a straightforward get-it-done process? Of course not! She’d get me arranged in the machine then open the door to the adjoining suite and ask a question. She set me up again, and with my breast pressed inextricably between two plates of glass, open the door to the reception area and talk to another person. At one point she left me hanging (literally and figuratively) for about 2 minutes while she went through yet a third door and talked to someone else! At the end of the session she motioned to the chair where I had left my clothes and said I should make myself comfortable (Si accomodi usually means make yourself comfortable, have a seat; but I now know it can also be used as for “lay back and relax”) and wait for the doctor. To me comfortable (and relaxed!) is fully dressed, so I began to suit up. I had just put my bra on and had my arms in the sleeves of my blouse when a man in a white coat opened Door Number 3 and my tech beamed with a cheery Ciao bello! Buongiorno! As they consulted over some technical issue (I don’t know if he was a doctor or a computer technician), I buttoned my blouse and donned my sweater. Standing there awkwardly I asked if I should wait. “Sì” and another wave to the chair. About 40 seconds later in sweeps another young woman who escorts me into the room where I thought the aging rocker was. Yup; He’s the doctor. I figured he was going to give me the “all clear” and I’d be on my way. Huge office with a desk on one side, mammograms up on the large computer screens, which the doctor is studying. On the other side of the office is an exam table, which the nurse escorts me to and tells me to undress. I ask: “What are we doing?” “An exam” she says, perplexed. I had heard they do ultrasounds on most everyone…. So I strip to the waist again and lay down (Si accomodi! ), only to be left there, half-naked and certainly not comfortable, while the doctor makes a phone call and the nurse comes-and-goes a couple of times. They ask me for my last films (not handy – they are in Oregon), and finally the doctor does the ultrasound. I give great credit for thoroughness. My favorite part (tongue firmly in cheek) was when he motioned bare-breasted me 20 feet across the huge office to see my mammogram close up, and then back again to the complete the exam. My only question is why they even allowed me to dress between the two exams. I suspect an Italian woman would not do so, would know she was moving on through Door Number 1 for the sonogram. In our own environment we know pretty-much what to expect, and I think in North America medical personnel tend to explain — maybe even over-explain — what you are to do, what is going to happen, what to expect. Here there seems to be a great assumption that one already knows what to expect. And of course in North America we have huge body-consciousness/privacy issues. Not worth having here…. I can hardly wait for a trip to the gynecologist. Can’t stop laughing. Great story. Speaking of farmers markets, saw Carl and Vern on Saturday. Hope your ear s were burning. Say hi to Ric. Ah so you talk about me behind my back? 🙂 Miss you guys! Yes, awkward is a good word…. There’s just no allowance for modesty in the medical environment. Once I “got” that, I could see the humor from an American point of view. Love it!! I so enjoy getting the chance to read your blog!! I am so happy for you guys and love and miss you both!! Can’t wait to see what the gynecologist is like!! Ciao Caro ! No more medical adventures for awhile I hope ! You and Wally need to come back. Many new places to take you. I remember feeling the same way when I lived in West Germany – everything is so different! It was a scary and emotional time for me to be there at age 18. I had recently lost my Dad and was still kind of a kid but a newlywed! At first, I really hated everything about it. I was so homesick! But, after living there for two years it became home and when I returned to the States surprisingly I missed West Germany! I really do embrace the differences, Gina! There’s more than one way to live a life. Sometimes things are better (the mammogram exam turned out to be more thorough which is great); sometimes there is less efficiency but better relationships develop. The whole experience is fabulous for us and I can hardly imagine leaving here . I hear ya! We developed some very close relationships with our military friends. We needed each other! By the way, Happy Easter! I was just thinking back to Easters past at your Mom’s house and the cute Easter dresses Nancy and I would wear. And, our fancy patent leather shoes! You are so great in seeing the humor in these things and writing it up so well. I just sent your blog to a friend that loves Italy and plans on making another trip. Your travel portions of your blog are marvelous and the differences between US and Italy just fascinates me. Thanks for the laugh today. Loved the post. Yes, once again at my expense. Just here to educate and entertain! LOL! Perfect finale! Love you dearly and can’t wait for the next post! Have a joyous Easter and if you see Il Papa, give him my blessings. I am enamored of our new pope. We keep hearing such wonderful things about this “Man of the People.” I just know you will meet him at Campo dei Fiori one day soon! I am also impressed with Papa Francesco. Love that he gave up the Papal apartment, the open-top jeep instead of pope-mobile, the Servant Leader actions and attitude. Seems to be a lovely man…. Hope he can administrate as well as minister. Wish the English press would use Francesco not Francis, though.